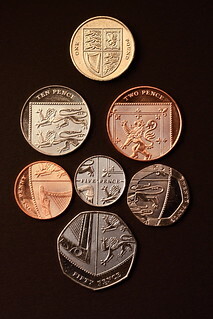 I finally got a one pound and a fifty pence coin, completing my set of the new British coins for 2008. I'm in the middle of a couple of dreadful weeks at work, with very little time for photography, gym, or anything else for that matter. I'm very tired and lacking in creative inspiration as well as the time to take these photos. The 365 days project is going through a rough patch. EOS 50D - EF-S 60mm macro - f/10 - 1" - ISO 200 - Standard picture style.